Taking a deep dive into IBS-D and how intuitive eating and non-diet approaches can play a role in the management of this disorder. This post is sponsored by Salix Pharmaceuticals. Thanks for supporting the brands that make TFD possible and as always, opinions are my own! About 1 in 10 Americans live with Irritable Bowel Syndrome (IBS). And this number is probably even higher because at least 75% of people affected by IBS are undiagnosed. This is a disease that affects millions of Americans, and yet there is so much frustration and embarrassment wrapped up in living with IBS that people don’t always seek the treatment and attention they deserve. Today’s post will uncover what IBS-D is, its potential causes, and what intuitive eating/non-diet interventions can be practiced to help improve symptoms. For the purposes of today’s blog post, we’re going to be zeroing in on IBS-D, but know that many of the interventions we talk about today are relevant to all forms of IBS. Also, I should add that today’s post is for educational purposes only and isn’t a substitute for individual medical advice. Aka talk to your doc about your symptoms. Imbalances in the gut microbiota (aka your gut bacteria). The proportions of good gut bacteria in people with IBS-D can be out of balance. What causes an imbalance in your gut microbiota? Could be a number of things: genetics, stress/anxiety, infection/disease, diet, drug use, or other causes. Communication problems between the brain and the digestive system. Did you know that our brain and our gut are constantly in communication with each other? There is a two-way communication system known as the gut-brain axis that allows our brain and body to know when you’re full, when to start digesting food and when to have a bowel movement. Changes in the signals along the gut-brain axis can result in IBS-D symptoms like pain and or diarrhea. Problems in the immune system. Due to infection or stress, your immune system can take action in the gut, causing the lining of the GI tract to become irritated or inflamed, which can result in IBS symptoms. Family history. Genetics plays a significant role in IBS-D – people who have family members with IBS are more than twice as likely to develop it. Stress or trauma in early childhood may also play a role. Anxiety and/or depression. Many people with IBS-D report feeling anxious or depressed but it’s one of those chicken and the egg situations of which came first? Could the stress and anxiety have caused changes in the gut microbiota, leading to symptoms, or are the IBS-D symptoms themselves exacerbating anxiety and depression? Eating disorders/disordered eating. There is a significant connection between disordered eating patterns and GI complaints. In fact, one study found that 98% of women with disordered eating complained of a specific functional GI disorder (heartburn, constipation, bloating, etc. ), 52% of which met the criteria for IBS. Again, it’s hard to know which comes first – in some instances the eating disorder itself leads to GI issues. On the other hand, sometimes GI issues like IBS-D can lead to disordered eating. I often see clients who seek out dietary advice for their GI concerns, wind up on an elimination diet, and continue to restrict several food groups, leading to an obsession with their diet and extreme fear of certain foods. WHAT ARE SYMPTOMS OF IBS-D? Symptoms can vary from person to person, but most commonly people with IBS-D will experience lower abdominal pain and cramping, gas, bloating, diarrhea/loose stools and urgency with bowel movements. Because of the nature of these symptoms, you can see why many people are embarrassed of their IBS-D and how it can significantly impact their quality of life. People may fear engaging in activities where there’s no bathroom nearby, they may have to cancel on plans, stay home from work or school, avoid long car rides or plane rides, etc. As someone who personally suffers from IBS-D, I know firsthand the frustration and shame that can come along with this disease. I’ve had plenty of nights where we’ve had to cancel our plans because I’m curled up in the fetal position on the couch with abdominal cramps. As a health professional, I have an added layer of shame because of my internal belief that “I should be able to figure this out” but the very nature of IBS-D is unpredictable. It’s extremely challenging to pinpoint symptoms to a specific cause. I share my personal experience with you to just let you know that if you’re struggling with this, you’re not alone and you’re not doing anything “wrong.” It’s not your fault that you’re suffering. Given that there are so many causes of IBS-D, there are ways to help. One such approach you’re likely to hear about are elimination diets. Now the only elimination diet that has been specifically studied for IBS-D treatment is FODMAPS, which can be a useful tool for pinpointing food sensitivities, as long as you’re adding back in the foods you don’t react to. I think many people forget that these elimination diets are not meant to be followed forever. You are supposed to re-introduce all the foods back in (one at a time) so that you only have to avoid or limit the ones you strongly react to. 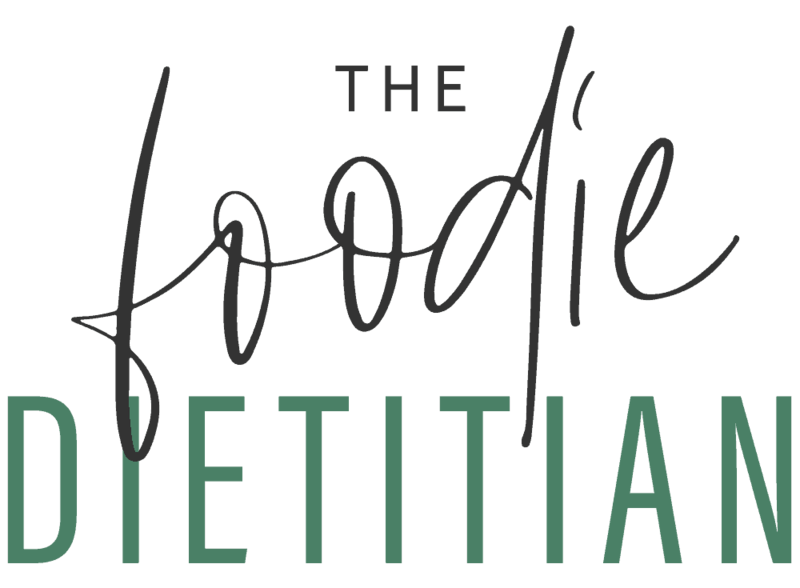 One of the issues I have with elimination diets is that it can often be a slippery slope to food preoccupation, fear around eating, and sometimes disordered eating. 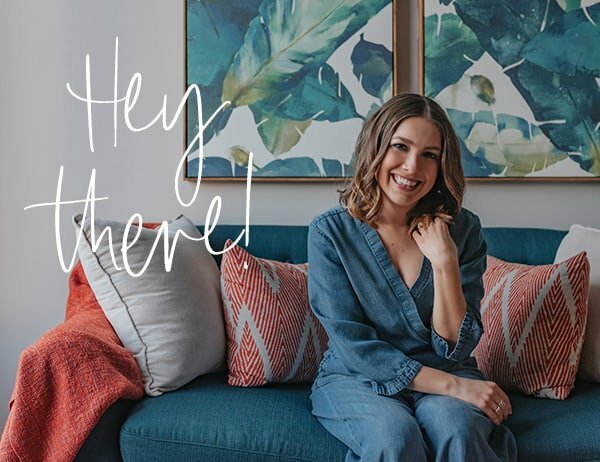 I see plenty of clients for whom following an elimination diet caused them way more stress and worsened their IBS-D symptoms (like my intern Michelle’s experience with elimination diets). 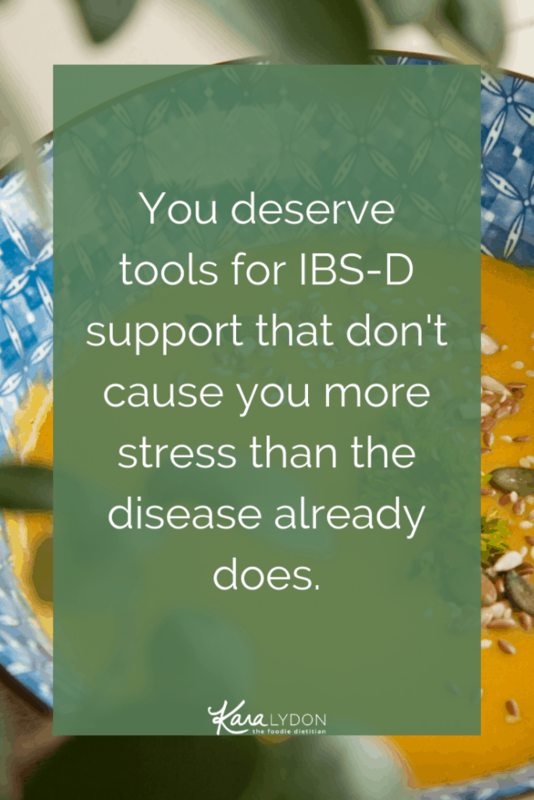 You deserve tools for IBS-D support that don’t cause you more stress than the disease already does. Enter, intuitive eating. I think there are many concepts and principles of intuitive eating that lend themselves to supporting a healthy digestive system. If you’re not sure what intuitive eating actually is then read my blog post here. Eating consistently throughout the day, every 3-4 hours. I always tell my clients regular eating promotes regular digestion. In our diet-culture society, we can be so quick to point to food as the culprit for our digestive woes and while food and nutrition can certainly play a role so can a myriad of other factors. 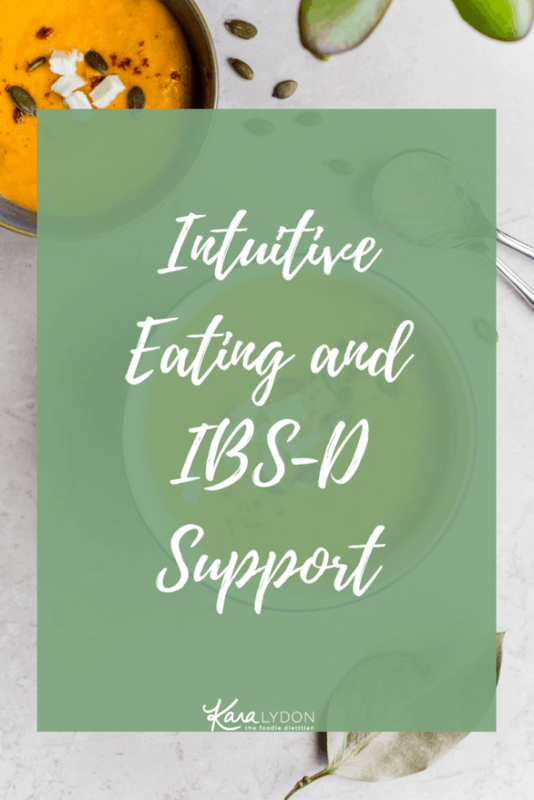 When suffering from IBS-D, I think it’s important for you and your provider to take a step back and look at managing IBS-D from a more holistic approach, trying things that aren’t diet related, especially when you’re at risk for or have a history of disordered eating. Try gut-mediated hypnotherapy (yup hypnotherapy for your gut), which has been shown to have durable effects for IBS-D similar to those of the low FODMAP diet. Speak to your healthcare provider to see if you could benefit from the addition of a probiotic supplement to help manage imbalances in your gut microbiota. Try a soluble (psyllium) fiber supplement, which can help bulk up your stool to make your bowel movements easier to pass and more complete. Get enough sleep. Sleep deprivation can exacerbate anxiety and wreak havoc on our system in general. Practice a nighttime routine to help you relax before bed. Try shutting off all devices 30-60 minutes before sleep and put on a sleep meditation or white noise when you get into bed. My go-to is “Breathing Into Sleep” via Insight Timer. Try yoga poses that combine deep breathing and stretches that target the abdomen to help relieve digestive discomfort. 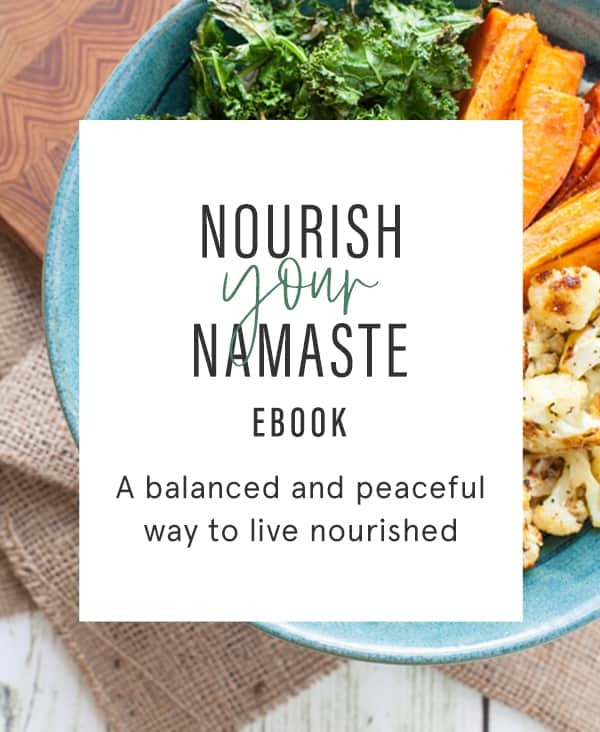 For more specific yoga poses for digestion, check out my e-book Nourish Your Namaste: How Nutrition and Yoga Can Support Digestion, Immunity, Energy and Relaxation. Use a stool when you poop! If you struggle with constipation or incomplete bowel movements with IBS-D less than 25% of the time, try placing your feet on a stool or block when using the toilet. This position with the feet elevated mimics your natural squatting position and helps to relax the muscles you need to access to have a complete bowel movement. Check out online resources like IBSDUpClose.com, which provide tools for people suffering with IBS-D and healthcare providers who are managing IBS-D. They even have a downloadable PDF of questions to ask your healthcare provider when starting a discussion around IBS-D.
Last but not least, remember that if you are suffering from IBS-D, you’re not alone. So if you start to feel shame or embarrassment or frustration rise up in you, shower yourself with a hefty dose of self-compassion. Talk to yourself like you would a best friend who is struggling with this. Don’t blame yourself for your symptoms. And remind yourself that there are plenty of other people out there who are struggling just like you. Remind yourself that you are deserving of care and support. Seek out healthcare providers who are willing to take a holistic approach and consider all of your options. Tell me, do you struggle with IBS-D? Is there anything that you’ve found to be helpful? i like your information it is very useful for me. It’s absolutely crazy how many people suffer from some form of IBS. This is a great article, Kara. This really stuck with me — “I should be able to figure this out”. You’re so right, as health pros, we feel a layer of guilt and shame when we can’t figure our own bodies out. Love your non-judgmental and curious approach. Great in-depth look into IBS and a really comprehensive list on how to manage it! I love the non-diet approaches because health really is a whole-body issue, sometimes food is only part of the solution! What a liberating approach to dealing with symptoms. Thanks so much for sharing this! I was in the middle of reading this when I actually needed to use the powder room. I had an embarrassing IBS moment at work. This has happened several times over the past several years as I have been working as an RD, and it’s so upsetting. I was actually just writing to Haley Goodrich about IBS this morning too because of her Ig story. I have focused on getting better sleep, I seek therapy for anxiety, engage in Barre3 and yoga because those feel good in my body, and I eat regularly. But I still am irregular, and this causes some major problems. I appreciate your post greatly and will keep trying to aid myself in managing this awful syndrome.